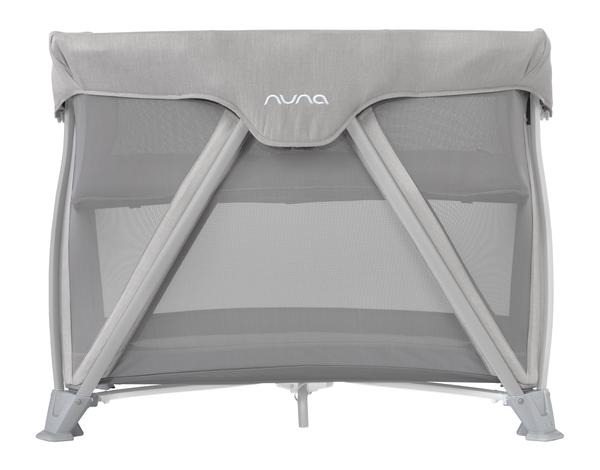 Size: * to 30 lb/35"
Article number: nuna COVE aire-frost-to 30 lb/35"
The contoured napper includes breathable mesh, a three-point harness and a customizable recline to keep your baby safe and comfortable as she sleeps. With a reduced width of nearly six inches when compared to the Nuna SENA, the COVE Aire is designed to fit perfectly next to your bed. As your baby grows, the napper can be detached to reveal a larger bassinet. Though similar to the bassinet on the Nuna SENA, the bassinet is positioned higher for the parent's convenience and is easier to remove, thanks to a zipper instead of snaps. Once baby reaches 15 pounds or 5 months of age, simply unzip the bassinet from the COVE Aire to create a full-sized space for your child to sleep and play, up to approximately 3 years. The COVE Aire is fully ventilated throughout its mesh sides, floor and mattress, allowing air to flow from every angle for maximum comfort. 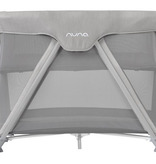 The Nuna COVE Aire travel crib includes the napper, bassinet, organic cotton sheet and carry bag.